Leading up into the Tomas Berdych and Andy Murray semifinal matchup on Thursday, both men have been fairly equal in their stats in all five of their matches: both have made more winners than unforced errors; both have served and returned well; and while Murray has lost just one set, Berdych has not given one up at all. What will be the deciding factor that propels one man to the year's first Grand Slam final? Serve performance could be a key factor in their semifinal matchup, especially maintaining a high level of play through high pressure situations. 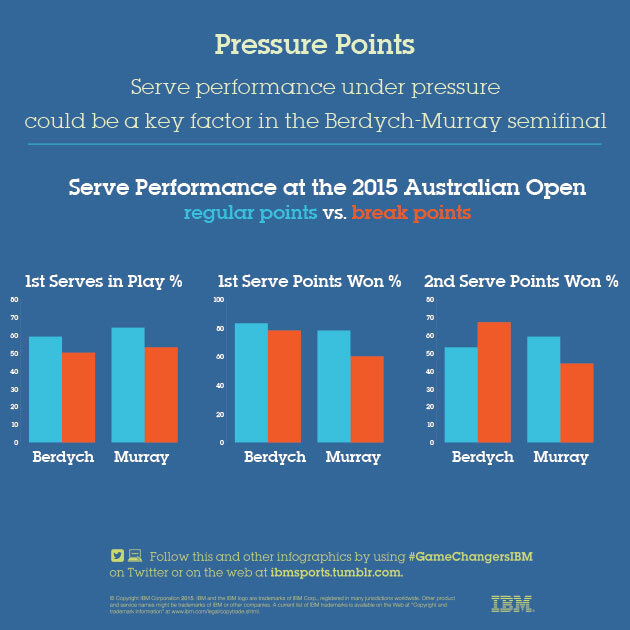 Check SI.com's Australian Open Daily Data Visualizations hub page throughout the whole tournament for the latest data-driven infographics and charts from IBM, the official technology partner for the Australian Open. IBM captures and analyzes the data that powers all of the Grand Slams, as well as the digital platforms that extend the experience to fans around the world.